Think Cabbage Is Just for Coleslaw? Think Again! Looking for a healthy, unique option for dinner tonight? 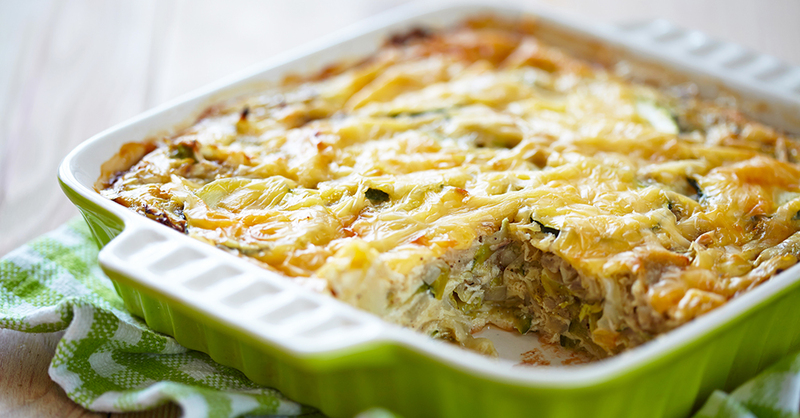 This cabbage zucchini and cheese casserole debunks all cabbage criticism! Rarely do we think of cabbage as anything more than a topping, after-thought, or St. Patrick’s Day side…until now. This recipe changes all that! Not only is this an inexpensive and easy dish, but it’s healthy, hearty and surprisingly filling as well. Put a whole head of cabbage to good use with this cheesy, hot-from-the-oven baked casserole. You can have it for brunch, lunch, or dinner, and since it mainly utilizes ingredients you’re likely to have on hand already, it’s also a great end-of-the-week, time-saving meal. Preheat oven to 350º F, and grease a 9x13-inch casserole pan. In a large bowl, whisk eggs with vegetable oil, oregano, and parsley, then season with salt and pepper. In a separate bowl, combine flour and baking powder, and slowly whisk eggs into dry mixture. Fold in the chopped onions, garlic, zucchini, cooked cabbage, parmesan cheese and fresh parsley. Transfer mixture to greased baking dish and place in oven. Bake for 20 minutes, or until the mixture begins to set. Sprinkle with shredded cheddar cheese and bake another 10-20 minutes, or until bubbly. Garnish with more fresh parsley and enjoy.